Despite the widespread attention garnered by Jessica Mitford's 1963 exposé of the funeral industry, The American Way of Death, the American way of death still includes average funeral expenses of between $8,000 and $12,000. What's more, every year conventional burials in the U.S. bury 800,000 gallons of embalming fluid, containing carcinogenic formaldehyde; hundreds of thousands of tons of wood, steel, copper, and bronze caskets; and millions of tons of concrete vaults. There is a better way and Fournier, affectionately dubbed the "Green Reaper," walks readers through it, step-by-step. 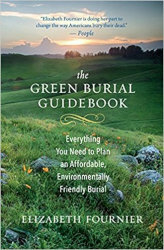 With green burial and home funeral basics to legal how and what's; choices in practices (at home, at sea, etc. ); and even detours into examples of celebrity green burials; this is comprehensive and compassionate guidance. The idea of a "good death" has been much discussed. Fournier points the way to good post-deaths, ones that consider the environmental well-being of the planet and the economic well-being of loved ones.